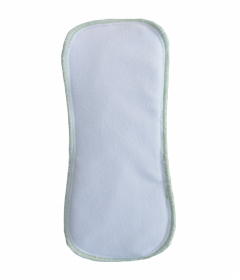 Buttons daytime inserts are made of 4 layers of absorbent micro fiber, with a luxuriously soft layer of fleece on top. Buttons cloth inserts snap into our one-size diapers covers. They come in 2 sizes for your growing baby (small fits babies 4 - 9 kg, large fits babies 9 - 16 kg).